Juxtaposed between the Brouwersgracht (�brewery�s canal�) and the Herengracht (�gentlemen�s canal�), this quaint little eatery boasts a premium location amidst the waterways of the jordaan region. The restaurant�s warm, autumnal art nouveau interior is so darkly evocative of fin-de-siecle living it may inspire a thirst for absinthe and Symbolist poetry�making it the perfect setting for the seasonal, neo-classic cuisine. The food has French-Italian bearings, but the menu also has traditional Dutch influences such as puffed pastries layered with salmon, shellfish, crayfish tails, and chervil beurre-blanc. The menu changes with the season ensuring that though the ambience, service and standards are maintained, what you order isn�t. The atmosphere here is buzzy and lively, indeed with the two storeyed building being in possession of high ceilings the decibel levels can leave the place feeling clubby almost! 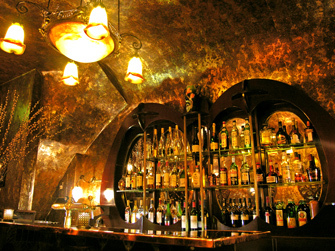 The bar offers a dazzling array of aperitifs and cocktails that make for the perfect pre or post dinner accompaniment. Service from the jovial bartenders, hostesses and waiting on staff always comes with a traditional Dutch smile and is generally conscientious and diligent. Perfect setting, lively ambience and high culinary standards, sprinkled with a few surprised and original tweaks makes Restaurant de Belhamel an all round barnstomer.